This entry was posted on Tuesday, January 15th, 2013 at 3:40 pm and is filed under QUIZ, Thailand. You can follow any responses to this entry through the RSS 2.0 feed. You can leave a response, or trackback from your own site. This looks like a late 1940 / early 1950 German plates, but it is NOT of course, as the letters do not coincide. It could also be an Indian plate, but the letters do not coincide in this case either . 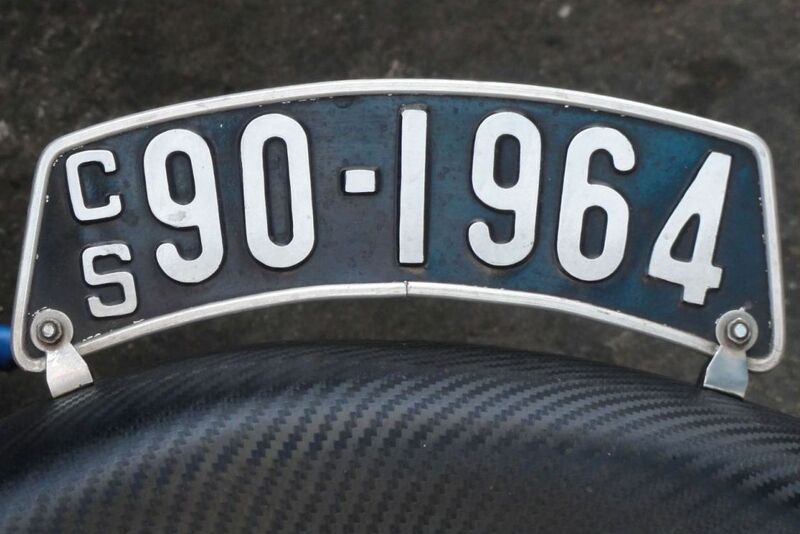 Could it be just a fantasy plate on a motor cycle from 1964 (make CS / model 90) ? Interesting. Although the plate would appear to have come form a pre 70s bike it is unlikely that it would have a carbon fibre mudguard, so I am inclined to agree with Brent in that it describes a model. Perhaps a “special”. I think the motorcycle is from 1964 and CS 90 is the make of this motorcyle.